The countdown has begun and there are less than 100 days until the opening of the 2014 Olympic Games in Sochi. It’s time to start brushing up on our luge/bobsled/skeleton knowledge, learning about the stories behind our amazing athletes, and start thinking about what they (and we) will be wearing as we cheer Canadians on to glory. 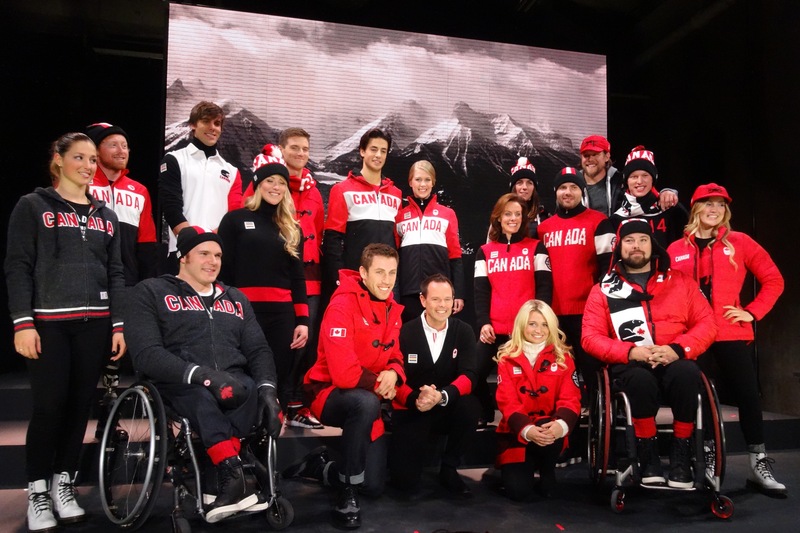 This week, Hudson’s Bay unveiled the Canadian Olympic and Paralympic Team Collection that will outfit our athletes at the upcoming Sochi 2014 Olympic & Paralympic Winter Games. The official wear is now available at all Hudson’s Bay locations across Canada and online at thebay.com. The uniforms are characterized by the hot colour blocking trend, strong display of the Leaf and the Crest, and a number of Canada’s traditional animals (including the loon, the polar bear and, of course, the beaver). Suzanne Sewell, Editor of SportsCafe, attended the unveiling and shared some awesome photos with us. 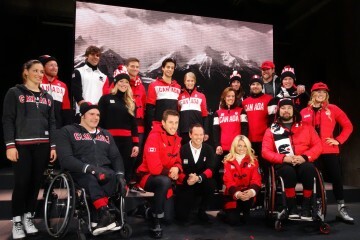 Our Canadian athletes look great on stage…they’ll look even better on the podium! 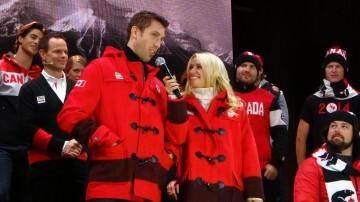 Pairs figure skaters Kirsten Moore-Towers and Dylan Moscovitch. The mittens have become iconically Canadian. I love the snow tipped white on this version. 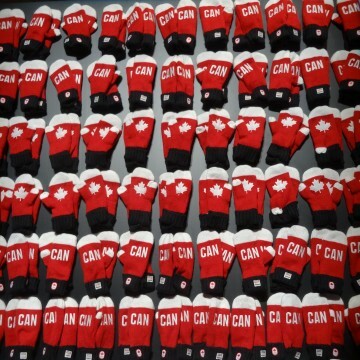 Of course, as Marcel Aubut, President of the Canadian Olympic Committee remarked, “They are not just our athletes’ uniforms, they are Canada’s uniforms.” So what are some of the highlights that we Canadians will be wearing? Reversible Down Jacket: Elegant and extremely warm for those cold winter days and nights, the jacket comes in Canada’s signature red and black colours and is branded proudly with the 2014 Team Crest on the sleeve. Knit Canada Beaver Sweater: Made from 100 per cent wool and fashioned in all three Canadian colours, red, white and black, this sweater is timeless and comfortable. Inspired by classic sports such as skiing and curling, this cozy Canadian sweater prominently features CANADA strewn across the front chest. 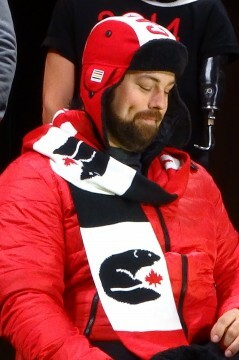 On either sleeve, the Canada Leaf and 2014 Team Crest sits patriotically, and on the back of the sweater, rests the beaver curled up around the Canada flag. Duffle Coat: A coat that demands attention – inspired by Hudson’s Bay’s classic Point Blanket, the all-red jacket is accented with a black stripe around the waist. Fashionable and smart, the single-breasted coat is a wool/nylon blend and fits snugly together with a zipper and trendy toggle style buttons. Colour-blocked tees: Simplicity, accessibility and style define the new colour-blocked tees. 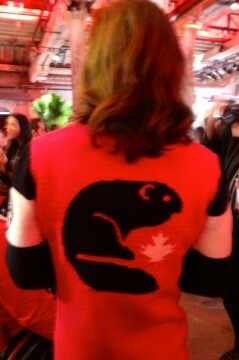 The body of the tees are black with CANADA written across the chest and complemented by red sleeves and white accents. 2014 Canadian Paralympic Tee: For the first time ever, Hudson’s Bay has partnered with the Canadian Paralympic Committee to design two unique tees that feature the proud emblem of the Canadian Paralympic Team and are available in red for women and black for men.